From 1912 to 1944, Intercontinental Rubber Co. operated a rubber plantation in Valley Center. The company started the farm with 40 acres planted in guayule, a desert shrub whose sap produces natural rubber. The plantation eventually grew to cover nearly 1,000 acres on the west side of Cole Grade Road, extending one-quarter mile south from Cool Valley Road. At the outset, the rubber produced from the guayule plants in Valley Center was used to manufacture commercial automobile tires. By 1916, the town had earned a reputation as the Guayule Capitol of the United States. The head of the operation were botanists Dr. G.A. McCallum and his nephew W.J. McCallum. The shrub had previously been grown in Mexico, but the Revolution of 1910 wiped out the commercial production of the plant in that country. The local farm played an important role in World War II. In the 1940’s, the U.S. Department of Agriculture created the Emergency Rubber Project Act to address a shortage of natural rubber for military vehicle tires. It was an essential part of the war effort. 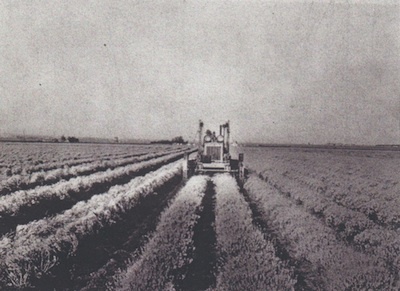 By 1944, Intercontinental produced its last crop of guayule. The war was over, the need for rubber had diminished, and a lack of rainfall made it impractical for the company to continue in business. A citrus grove covering several hundred acres was later planted on the site by Sam Perricone.